Czech Republic: New national stadium a realistic option? National football association pushes forward to have a new 30,000-capacity arena in time for Euro 2020. But financing is nowhere to be found and future use of the stadium is very doubtful. Aktuálně.cz report. The monstrous stadium in Prague's Strahov neighbourhood, arguably the world's largest, has been subject to numerous redevelopment plans. We've already been treated to renderings showing it as office district, gardens, housing or even a giant Olympic Stadium, should Prague have won the 2016 Games instead of Rio de Janeiro. But for now Strahov is Sparta Prague's training centre and this seems unlikely to change soon. 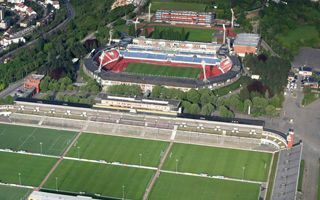 However, the secondary Stadion Evžena Rošického located just west of it is falling into despair and might get a complete redevelopment. The idea of rebuilding it into a modern 30,000-seater has been raised by Czech football association, FAČR. Another sports entity, Czech Sports Union (ČUS), endorses the plan. Reconstruction of the old stadium would be a very good option with Euro 2020 in mind. Czech football authorities already confirmed they want to apply for group games, for which at least 30,000 capacity is needed (and only two stadiums that small may be selected). However, to submit a final bid to UEFA, FAČR also needs financial guarantees for their plan. Those will be seeked from the Prague municipality and Czech government. Rebuilding the stadium is though to cost some CZK 3-4 billion ($150-200m / €110-145m). Neither of the sports associations is able to provide at least a significant portion of the funding. Private partners are doubtful, while the government sees no need for such a project. Education minister Marcel Chladek went as far as to dismiss the plan's sense completely. But even if the stadium is built, filling its event calendar might prove a real challenge. FAČR president Miroslav Pelta doesn't seem bothered by the issue. “Certainly I'm not worried about the potential use of the stadium, because, if built, it would be the home to national football team and football in general”, said Pelta for Aktuálně.cz. This doesn't seem like a solid plan – with just 6 official games per year the national team wouldn't be a strong tenant, even with all games sold out. This is why Aktuálně.cz approached all major clubs across Prague and asked, whether any of them would consider taking tenancy. Sparta Prague declined to comment, claiming the idea is at a very initial stage. Slavia were more strict: „Slavia is traditionally from Eden and we see no need to change that”, said a club spokesman. Smaller sides showed more enthusiasm, but not entirely serious approach. Dukla Prague agreed holding European games at the new stadium might be an option, as Juliska don't meet UEFA's regulations. But moving their domestic fixtures into a 30,000-capacity stadium would be suicidal with under 2,000 average attendance. Bohemians and Viktoria Żiżkov both reacted with laughter. Neither club denied their will to play at the new stadium, but in both cases the teams would first need to reach... Champions League level. Which at this point sounds as realistic as the new national stadium.